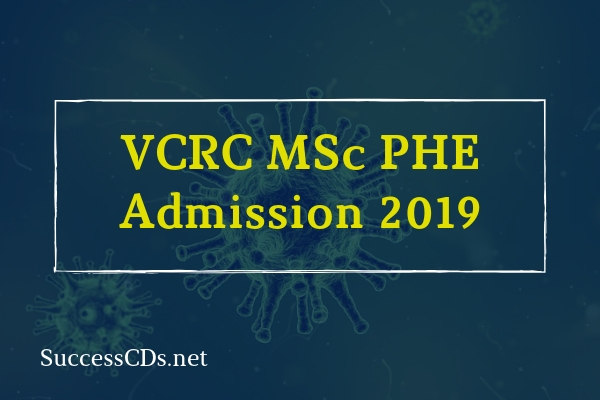 Candidates can check the complete information of VCRC M.Sc. Admission 2019 application process, eligibility criteria, and other information through this page below. They will be required to produce Eligibility Certificate from Pondicherry University, Puducherry, subsequently for recognition of their qualification. Applications should be routed through the employer or sponsoring/nominating authority/organization. The envelope containing the application form should be superscribed as "APPLICATION FOR ADMISSION TO M.Sc., PHE" and sent by Registered/Speed Post to "The Director, Vector Control Research Centre, Medical Complex, Indira Nagar, Puducherry-605006"